The Pew Research Center‘s report entitled, “Modern Parenthood” recently came through my twitter feed. Amidst so much recent talk about women and our professional lives and “balance”, I loved reading this treasure trove of data about how moms and dads are spending our time, how that has changed over the last few decades, and how we feel about it. First, let me say that if you’re not following Pew’s work (including that of the fabulous Susannah Fox) you really must check it out. Here are a few things that stood out for me. 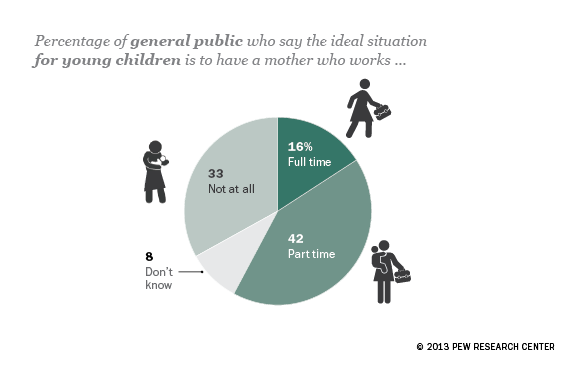 Moms are working more outside the home, but still not as much as dads. 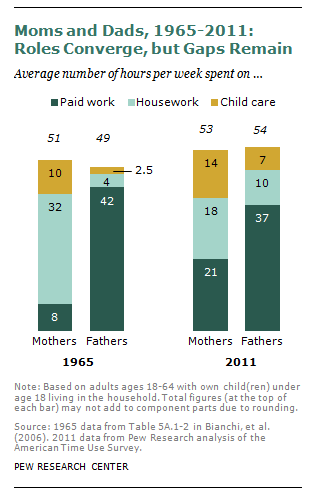 Dads are doing more work at home, but still not as much as moms. Although this finding is not unexpected, it really highlighted for me that we, as a society, need to think more about how these changing roles affect both women AND men (not to mention the kids). 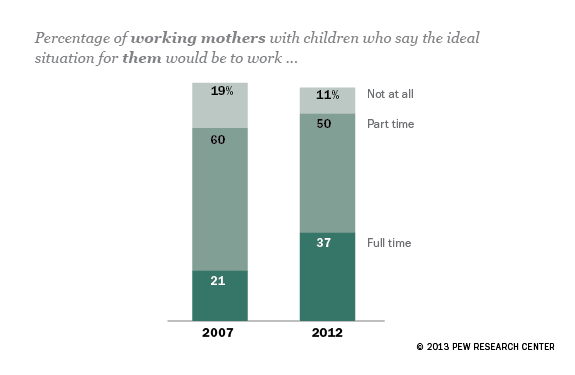 People seem to have mixed feelings about how much mothers should be working outside the home. This finding doesn’t surprise me at all. Just talk to a few friends or read a few blogs and you’ll find that people have very strong but greatly varying opinions about what’s best for children in terms of how much mothers work outside the home. Here’s my opinion. The best mother is a fulfilled mother who feels at peace with how she is balancing her life. This a highly individual decision and depends greatly on each woman’s particular career path, how much support they have in raising their children, and their financial situation. I know amazing moms who are stay-at-home moms, some who work part-time, and others who work full-time or go to school. Finding balance is hard for a lot of working parents. 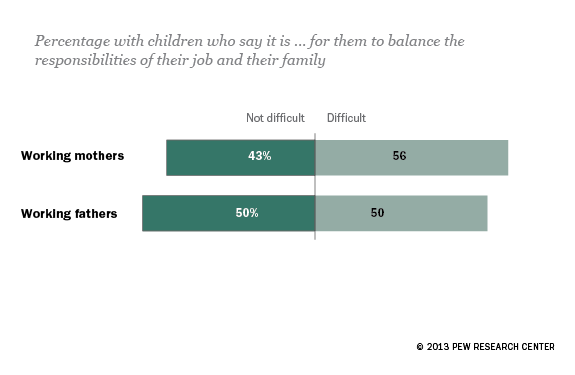 50% of men and 56% of women said that it was difficult to balance work and family. I actually found those numbers to be surprisingly low. The vast majority of working parents I know are in a constant search for balance nirvana. Most of the time my own life- working full-time with a family- is one skipped nap away from chaos. And I only have one child. Maybe we all need to talk to the 43% of moms and 50% of dads who have it figured out. Socio-economic status matters. Throughout my read of the report I found myself wanting to know more about the socio-economic status of the respondents and how this impacts how people spend their time. We were given a bit of a glimpse of this in a question regarding ideal work situation. Single mothers and “women in difficult financial circumstances are among the most likely to say working full time is the ideal situation for them”. Most low and middle-income families are making decisions regarding whether and how much they work based on what is necessary, not what is “ideal”. Many women stay home from work because they are priced out of child care. Or, fathers work two jobs and see their kids very little in order to make ends meet. Finally, I was happy to see that many parents feel like they are doing a good job. Amidst all of the chatter about what it means to be a “good parent”, I’m glad to know that many have realized that one size does not fit all. Kids need our love and our time. How we parse that out is different for everyone. I highly recommend you read the entire report (written by Kim Parker and Wendy Wang) or flip through the slideshow. What stands out for you? This entry was posted in Health, Parenting and tagged balance, Modern Parenthood, Pew Research Center by My Two Hats. Bookmark the permalink. I don’t think this report could have been better timed, what with the media blitzkrieg surrounding Sheryl Sandberg’s book “Lean In” (which I can’t wait to read). 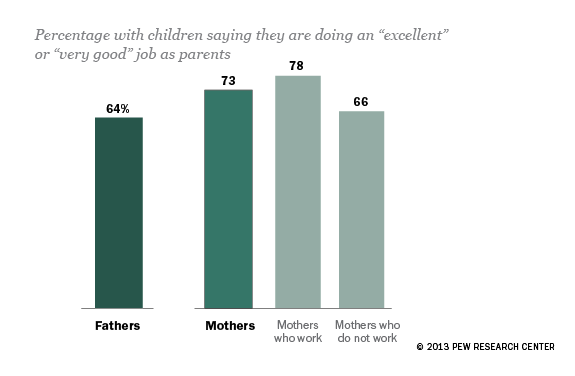 My Pew Research colleagues contributed this data at the zenith of the national conversation on parenthood, particularly mothers’ choices about work. So instead of guessing about what people want or what actions they take, we have numbers. Of course the other ongoing conversation about parenthood happens at the kitchen table — or in your own head — not on a national talk show. That’s where people are really reaching for the balance. My favorite aspect of the study is the fact that this is the FIRST STUDY EVER (sorry, had to emphasize) to ask dads if they would like to stay home with their kids, given the choice. It’s been assumed forever that every mom would want to stay home, but nobody had ever asked the dads. Let that assumption sink in for a minute. There’s so much to think about — your post helped me to see points that I hadn’t focused on or seen in other coverage. Thanks! Thanks so much for your comments, Susannah. Completely agree! I’m really glad that the study emphasized asking both moms AND dads about their preferences. Hoping more data and conversation about all of this helps employers realize that there is no “one size fits all” for parents of either gender. And, yes, “Lean In” is definitely on my reading list too. I’d love to see data on how the changing demographics of family structure and employment effects decisions regarding family size. I work full time as a physician and have 4 kids. After the 4th, my husband and I had to find a way to more of our work from home. We just couldn’t keep up. I think many double income families choose to limit family size due to the demands of employment. Nira, that is exactly what I was thinking! Really interesting points- you all have me thinking a lot now about how people’s responses for many of the questions might change based on both number of kids and ages of their kids. I bet it does make a big difference!